Are you looking for Weight Loss Workouts For Men? If so, this article is exactly what you need. In it, I'll walk you through an honest, unbiased review of my top 5. You'll learn what these workouts are, how they can help you, how you do them and what my overall ‘out of 10' mark is for each. From the information I share below, you will learn exactly why these are the 5 best weight loss workouts for men, and be able to decide exactly which one is best for you, based on your goals, preferences, and schedule. Most importantly, all 5 of the workouts I am about to show you can help you lose weight, increase your metabolism and build muscle. This is what we help guys like you do! Without further ado, let's dive right into this “5 Best Weight Loss Workouts For Men Guide”. Quick definition: Fat burning cardio workouts that alternate between burst & recovery intervals. High Intensity Interval Training (or HIIT for short) is a cardio style workout that is designed to help increase your metabolism and burn fat in the shortest amount of time possible. Unlike “traditional cardio workouts” where you would move at a steady pace on a treadmill, bike, or elliptical for 45+ minutes – HIIT workouts alternate between short bursts of maximum effort interspersed with periods of lower effort or active rest. HIIT can be done with weights as well as with cardio exercise. How will HIIT help me with weight loss? HIIT exercise is one of the best weight loss workouts for men to burn fat in the shortest amount of time possible. Here are a few of the main benefits. Proven to increase your heart health and VO2Max. You can use ANY form of cardio or weights exercise you prefer. Whether you like running, swimming, kettlebells or bodyweight – you can apply the HIIT structure to any workout. HIIT boosts your metabolism for up to 24 hours after a single session. You need no equipment and very little space. Here at the Fit Father Project, we incorporate HIIT into all of our weight loss workouts for men, like our famous Fit Father 30X Weight Loss Program, because of how effective, time-efficient, and flexible the workouts can be. In short: we believe HIIT is a great fit for you if you want to burn fat and you're short on time, travel often, or don't have access to a gym. How do I do my first HIIT session? Do 30 secs of high intensity (BURST) exercise as hard & fast as you can. Good choices are: jump squats, burpees, kettlebell swings, sprints, fast swimming, etc. After your 30-second “Burst”, immediately do 30 seconds lower intensity exercise to recover. If you're bursting with squats/burpees, you can do some jumping jacks or simply jog in place. If you're biking, swimming, or running simply scale back the pace. Repeat this 30-seconds burst, 30-seconds recovery structure 10-20 times. Finish with a 5 minute cool-down. That's it! Pretty simple right? HIIT is an incredibly effective fat burning workout that requires little or no equipment and just 20 minutes of your time. How would I rate HIIT for weight loss? I would personally rate HIIT as an 8/10 due to how easy it is to do anywhere without the need for equipment, the excellent fat burning effect it has, and the variety of exercises you can use with it. Quick definition: The most time-efficient fat burning workout developed by a Japanese physiology professor. What’s Tabata Training all about? Tabata training is based on a 1996 study by Professor Izumi Tabata. Dr. Tabata was attempting to figure out the most time-efficient fat loss workout possible. After 8 rounds of a given exercise, switch to the next exercise. Rest 1 minute rest between exercise changes. How will Tabatas help me with weight loss? Tabatas are scientifically proven to provide better weight loss results than traditional cardio in a shorter time (20 min sessions). Tabatas are proven to increase your cardiovascular fitness, like HIIT. It's very easy to track and monitor your progress of number of reps you perform in each 20 second “on” period. You can perform a wide variety of exercises in the Tabata workout structure – allowing more variety in each session. Like HIIT, you need little or no equipment and very little space. How do I do my first Tabata workout? How would I rate Tabatas for weight loss? Personally, I think Tabata workouts are one of the best weight loss workouts for men and would just edge out standard HIIT workouts with a 9/10 effectiveness. In a sense, Tabatas are really just a more specific form of HIIT. 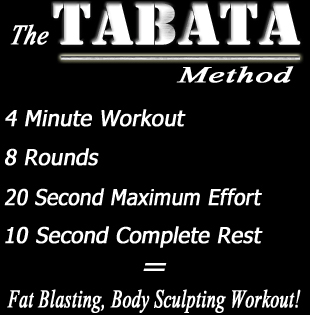 For busy guys like you and me, I think Tabatas are awesome due to the ease of workout structure and the fact that you only need to find 4 exercises to do for each Tabata session.